Coming in hot to disrupt the breakfast sandwich conversation is this beguiling Frankenfood from reddit. 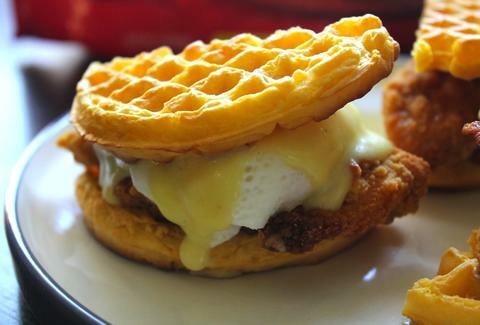 Amateur chef/savior winnai composed the Chicken and Waffles Eggs Benedict by cooking two waffles, frying up some chicken, poaching an egg, and then combining the whole thing into the hollandaise-drenched masterwork you see before you. You can follow her recipe over on her blog I Run For Wine, provided you're prepared to run off 57 chicken & waffle egg sandwiches come spring. Kristin Hunt is a Food/Drink staff writer for Thrillist, and would like someone to make this for her birthday brunch. Follow her at @kristin_hunt.